On Saturday, I finally got the chance to go to the range. It was by no means an ideal day for shooting. Temperatures were about 52 degrees F, winds somewhere between 10 and 15 mph, and the relative humidity had to be in the 90% range with a threat of showers at any moment. Also, the range was muddy and they made you park farther out to keep from messing up the road. I decided to include the photo below to give you a better idea of the weather (notice the flag... it was very windy). The first order of business was to shoot on the 50 yard range to make sure I was on the paper and then dial in the point of impact of my bullet to be 1/2" high based on a 200 yard zero and the ballistics data for my setup. Also, this was my first opportunity to actually fire the rifle and get a feel for the recoil and trigger pull. My first impression of the trigger was that it was good. It actually surprised me when the rifle fired. As far as recoil goes, it didn't seem to stand out as having any perceived kick. The muzzle did jump when I fired, but it did not seem to have a great recoil. I think I'm going to put the shim in place that will make the stock more in-line with the barrel. I was surprised after my first shot because I was not on the paper. I was on the card board, but not where I wanted to be. My first shot fell off the paper to the left. I thought that the laser boresighter I used would have gotten me a little closer and I'm going to update that review after I figure out if there is anything I can do to adjust the accuracy of the boresighter. Since there were more shots on the cardboard other than my first, I did a quick visual inventory of the shots and then made another. That accounts for the two shots off the paper that are 6 to 7 inches left of the bulls eye. I thought no big deal. I started adjusting my windage to the right and then took a couple of more shots. Again I'm now about 3 inches to the right. So again I thought I would adjust the rest of the way to zero based on my target turret markings. To my surprise, I ran out of travel on my right windage adjustment. Now I'm thinking, what the heck. I screwed it to the left and then the right again. It went to the same location. Since it was adjusted all the way over to the right, I decided to take a few more shots. You can see below how far I was from being able to zero the scope. It was off a little over two inches at 50 yards. Now I was really puzzled. When you look at the groups below, keep in mind that I was shooting 147 grain PMC (plinking) ammo at 50 yards with my target jumping around like a frog on a hot skillet due to the wind gusts that day. I should have taken a photo of the target setup. The range had three metal T-posts driven in the ground with two strings running between them. You clamped your cardboard to the strings at the top and bottom. Like a dufus, I put my target in the middle of the posts, which allowed it to jump around the most in the wind. Considering all this, I'm very optimistic on the accuracy of the rifle when shooting it with better ammo and a better target setup. The next thing I did was remove the scope and rings and reinstall the rings flipped 180 degrees. If it was a rings issue, it should have been shooting to the right instead of the left. I adjusted the scope back to what I thought may be close to a zero position again. My next 2 shots were not on the paper or card board. I had the guy next to me at the range watch me and he could see where I was hitting in the dirt to the left. I adjusted to the right a bunch of clicks and shot the third hole off the paper but in the card board (see below). After seeing this, I adjusted it all the way to the right and took another shot. Basically, this final shot put me in the same location as before. Thus, it was not an issue with the rings. I took the scope off again and looked really carefully down the rail and barrel and in my mind I could see that they were not in alignment. That's when I called it a day and decided to do the rest of my investigation at my house. I tried several methods to make the issue visible and take some type of measurement of misalignment. The following two images show what I finally discovered. The final method was to put a carpenter's square against the rail on both sides and compare were the square was at the tip of the square in relationship to the barrel. 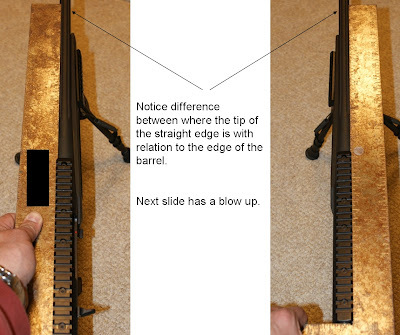 As you can see, the barrel was pointing to the left when compared to the rail and this is exactly what I was seeing at the range. Now knowing that it was not some type of optical illusion, when I looked down the rail and compared this to the barrel, it was clearly evident that there was misalignment. All this was done on Saturday and that day I finally decided that this was a FNH issue to resolve. I typed out an email and attached a PowerPoint file showing the problem and sent it to FNH on 3/13. 3/15 Monday - At noon, I got a call from the FNH Service Center. I spoke with the representative at FNH Customer Support and he reassured me that FNH was going to take care of the issue. That afternoon, he sent me a prepaid postage UPS label for me to send the rifle to their Service Department in Arnold, Missouri. Also, that afternoon I rushed home from work, boxed it up and got the rifle to a UPS drop off center by the 5:30 pm deadline so it would go out immediately. While talking with him, he said they have never seen this type of issue on this rifle and they were anxious to get their hands on it so they could understand the problem. He said there was a good chance they would reissue me another rifle. We will soon see. 3/17 Wednesday 10:26 AM -Rifle was signed for at FNA Service Center in Arnold, Missouri. 3/18 Thursday About 4:00 PM - I called the customer service representative at the FNA Service Center and he was out, so I left a message to have him call me because I was very curious on what they determined was the problem with the rifle. 3/19 Friday About 1:00 PM - The customer service representative called back and said they were going to exchange the rifle and there was already a new rifle on the way. He provided a tracking number and said I should receive the rifle on Monday. Now that's what I call Customer Service! He was not able to give me any details on what they found to be the actual problem (which is what I expected to happen). They replaced the rifle with a new one and have the old one to study and see if there are any improvements that could be made to their processes which would prevent this in the future. Overall, I'm pleased to see the commitment that they have to their customers. 3/22 Monday About 10:30 AM - My new FNAR rifle arrived just as they said. Just as soon as I took it out of the box, I looked down the rail and barrel and they look in line. I'm still shocked that they were able to turn this around in one week. Again, great job FNH. 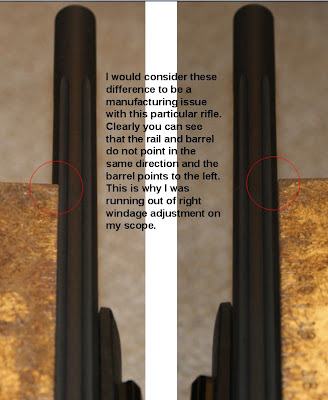 If you ever purchase a rifle with a rail already installed, do everything you can to study the alignment of the rail and barrel before you become the proud owner of a potential problem. I should really expand this to any rifle that has a scope mount should be checked against the barrel. When running into problems like this at the range, be patient. Since I was on paper, I could have shot some groups at 100 yards to get a good idea on accuracy of the rifle. At minimum, I could have moved my target closer to a post and shot a 50 yard group. If you purchase a rifle from FNH, they are going to take care of you and stand behind their products! This is great. I have been interested in the FNAR ever since they came out. Customer service sounds FANTASTIC! can't wait to hear how she shoots. Personally I have been Looking at one of the Rock River Arms LAR-8 or one of these FNAR's for my next gun purchase. When I was considering buying the FNAR I was also looking at the Rock River LAR-8 Standard Operator. I called Rock River and they said I should consider 8 to 12 months before realistically getting one. That was the deciding factor. I got the FNAR now at $1150 after their $150 rebate. Now that's a deal. With the money I saved, I was able to put it into a better scope. Interesting issue with the rail alignment. I had a Kimber with the wrong bolt in it and it took 2 weeks to get it back and I am in the same state and talked to the quality manager twice. Great gun now, but started out a little shakey. Congrats. Very nice blog. I am a retired marksman from navy infantry in Spain and worked with Nato forces. I got one of the light barrel model around 8 months ago for recreational purposes to nail paper targets. I am achieving .5 to .4 MOA consistently even with Rem and UMC standard loads. I have 2 words for you folks: Buy one! If anyone is interested I can share some targets and experiences. Everything is good. Cannot compare with RRA but initially for what I have seen RRA will need a wheel-barrel to carry around. Also no piston which is a big deal for me but might not for others. Piston is long overdue in all AR systems. Same thing is wrong with mine! Brand new out of the box shooting WAY left. Checked the rail alligment here at the shop and Bingo. Unfortunately I'm not getting the same stellar service. One month in and still nothing. I will keep everyone posted on how this is rolling but currently I'm not a happy camper. I am VERY impressed with the level of customer service you received from FNH. Also, very nice blog. I can say this is still a problem with the FNAR. I'm not sure when my rifle was made, but I purchased it new on 3/4/13 from an online dealer that just received a shipment. I called FNH and they sent a UPS label only upon request as their service area of their website does not mention this. No way I was paying for shipping, I'd already lost money. They said 4-6 weeks to resolve, longer side of the range if it needs to be replaced...which I assume since drilling and tapping new holes is probably not going to happen. So if you go shopping for an FNAR, take a square. If you get one online, take a square and do not accept the FFL.